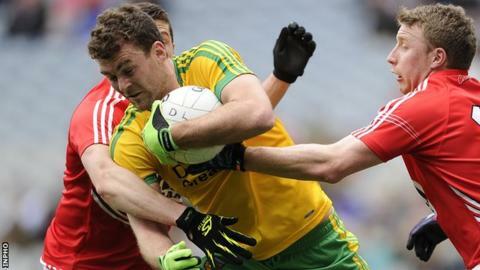 Donegal manager Rory Gallagher is optimistic that Eamon McGee will be fit to face Mayo in Saturday's All-Ireland quarter-final after an ankle injury. The defender picked up the injury during the weekend qualifier victory over Galway at Croke Park. McGee failed to complete the game, with Anthony Thompson brought on by Gallagher as his replacement. Meanwhile, Gallagher rates Karl Lacey's chances of making the quarter-final after a knee injury as 50/50. The Four Masters clubman sustained ligament damage in the Ulster SFC final defeat by Monaghan last month. The injury kept Lacey out of the Galway match but he could return for the last-eight showdown against the Connacht champions at Croke Park. Lacey was named Footballer of the Year in 2012 after helping Donegal win that year's All-Ireland title and has also been named in four All-Star teams. "Eamon rolled his ankle again but the good thing is it is not swollen and we are quite optimistic he will be grand," said manager Gallagher. "Karl is recovering well and we are more optimistic than we were, but it will be a tight call."